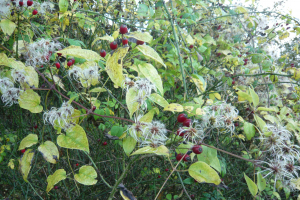 Observation - Old Man's Beard and Rose Hips - UK and Ireland. Description: Found growing together near entrance to wood. I thought they looked pretty together. Found growing together near entrance to wood. I thought they looked pretty together.